Studio Indigo is proud to be collaborating with Moonen Yachts on the build of a new 36m superyacht, the sistership of Brigadoon. YN199 is the second yacht to be built from the Moonen Martinique line, with the exterior design by Dutch designers Rene Van der Velden and Naval Architect, Diana Yacht Design. Following the success of Brigadoon, which is currently nominated for a BDA Award, Studio Indigo was invited to develop the interior design of the new YN199. 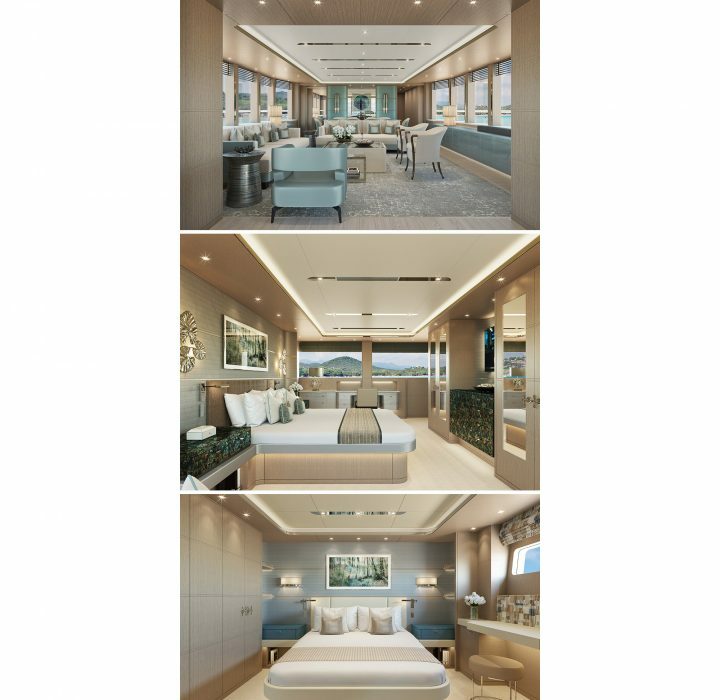 The brief was to develop the layout and architecture of the yacht to create both a timeless and sophisticated interior whilst maximising the feeling of space and light throughout. Integral to this was to design-in flexibility to the interior architecture to allow a prospective Owner to adapt or personalise the interior to make it feel unique to them. Among several layout changes, Studio Indigo added another luxurious Day Head to the Bridge Deck, while the reconfigured Master Suite now benefits from a his and her bathroom, with a dramatic circular shower feature and high-level panoramic windows. Using pale, wire-brushed veneers blended with accent materials to add colour, texture and personality, the interior can be customized easily to suit an Owners sense of style and taste. Panelling can be interchanged between fabric, leather or wallpaper, while still keeping a consistent and harmonious feeling throughout the interior spaces. Crisp, architectural shadow gaps have been carefully blended with signature curved corners to create identity and continuity throughout. Every effort has been given to modifying the internal spaces to maximise the sense of space and ease of movement, making the yacht feel significantly larger than her length suggests.